Angela Panoskaltsis-Mortari, PhD is a Professor of Pediatrics in the Division of Blood and Marrow Transplantation. She is also a Professor of Medicine in the Division of Pulmonary, Allergy, Critical Care and Sleep Medicine. Dr. Panoskaltsis-Mortari is the Director of the Cytokine Reference Laboratory, the Director of the 3D Bioprinting Facility at the University of Minnesota and Vice Chair for Research for the Department of Pediatrics. Dr. Panoskaltsis-Mortari received her PhD from the University of Western Ontario. She was a post-doctoral fellow in the Department of Pathology at the University of Alabama and a post-doctoral research associate in the Department of Pediatrics at the University of Minnesota. She joined the University of Minnesota faculty in 1995. Panoskaltsis-Mortari has board certification from the American Board of Medical Laboratory Immunology. She is a member of numerous immunology, pulmonary and hematology professional societies, and the author of over 250 articles which have appeared in such publications as Journal of Experimental Medicine, Journal of Clinical Investigation, Blood, Biology of Blood and Marrow Transplantation, American Journal of Physiology (Lung, Cell. & Mol. Physiol.) and Journal of Immunology. 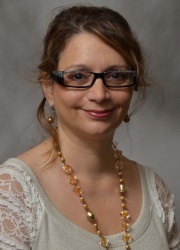 With 25 years of experience in animal models of stem cell transplant, lung injury, mesenchymal stem/stromal cell therapy and the biology of graft-vs-host disease (GVHD) after bone marrow transplant, Dr. Angela Panoskaltsis-Mortari’s work has evolved into the bioengineering field, and she is recognized as one of the thought leaders in lung bioengineering. Dr. Panoskaltsis-Mortari’s laboratory research focuses upon 4 major themes: 1) bioengineering the lung using adult stem cells and decellularized whole lung scaffolds with the goal of creating autologous lungs for transplant; 2) bioengineering autologous tissues such as trachea and esophagus using 3D bioprinting and customized hydrogels; 3) 3D bioprinting of cancer models; 4) enhancing proper lung repair and regeneration by manipulating the extracellular matrix using mesenchymal stromal cells and other cell therapy strategies. Dr. Panoskaltsis-Mortari established and directs the 3D Bioprinting Facility at the University of Minnesota. She also directs the UMN Cytokine Reference Laboratory (a CLIA-licensed facility) and is board-certified by the American Board of Medical Laboratory Immunology. She is a member of the Stem Cell Institute, the Institute for Engineering in Medicine, the Lillehei Heart Institute, the Masonic Cancer Center and the Center for Immunology. She is funded by the NIH, has mentored many post-docs, MD trainees, graduate students and undergrads in various training programs, and collaborates with ARMI-BioFabUSA. Her goal is to realize the potential of regenerative medicine by converging the fields of stem cell biology, mechanical & biomedical engineering, biomaterials, physiology and surgery to bioengineer autologous tissues/organs for transplant using a patient's own cells that would not be rejected by their immune system. A selection of Dr. Panoskaltsis-Mortari ‘s recent publications. Wendt C, Tram K, Price AP, England K, Stiehm A, Panoskaltsis-Mortari A. Clara Cell Secretory Protein improves Survival in a Murine Obliterative Bronchiolitis Model. Amer. J. Physiol: Lung Cell. Mol. Physiol., 305:642-650, 2013. Hall MW, Guo C-Y, Panoskaltsis-Mortari A, Jouvet P, Ferdinands J, Shay D, Nateri J, Greathouse K, Sullivan R, Kiesling S, Randolph AG for the PALISI Network PICFlu Study Investigators. Innate Immune Function and Mortality in Critically Ill Children and Young Adults with Influenza: A Multi-Center Study. Crit. Care Med., 41, 224-236, 2013. Yi D, Wiedmann TS, Naqwi A, Price A, Panoskaltsis-Mortari A. Distribution of aerosols in lungs of mice with obliterative bronchiolitis by fluorescent imaging. Exp. Lung Res. 38:325-332, 2012. Srinivasan M, Flynn R, Price A, Ranger A, Browning JL, Taylor PA, Ritz J, Antin JH, Murphy WJ, Luznik L, Shlomchik MJ, Panoskaltsis-Mortari A*, Blazar BR* (co-senior authors). Donor B-cell alloantibody deposition and germinal center formation are required for the development of murine chronic GVHD and bronchiolitis obliterans. Blood. 119(6):1570-80, 2012. England KA, Price AP, Tram KV, Shapiro SD, Blazar BR, Panoskaltsis-Mortari A. Evidence for early fibrosis and increased airway resistance in bone marrow transplant recipient mice deficient in MMP12. Amer J Physiol: Lung, Cell. Mol. Physiol. 301:L519-526, 2011. Price AP, England K, Matson A, Blazar BR, Panoskaltsis-Mortari A. Development of a decellularized lung bioreactor system for bioengineering the lung: The matrix reloaded. Tissue Engineering, 16:2581-2591, 2010. Click here to see a complete list of Dr. Panoskaltsis-Mortari’s studies which have been published by academic and research journals.